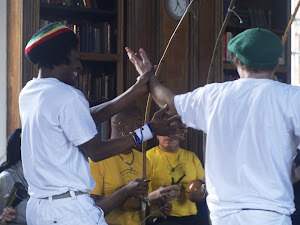 Capoeira Angola - South London: No Class Tommorow (Wednesday) Roda at FICA London - Roda Memorias de Gengibirra. No Class Tommorow (Wednesday) Roda at FICA London - Roda Memorias de Gengibirra. Come along on this Wednesday 29th of May to our Monthly Roda "Memórias do Gengibirra" organised by us and FICA London. This month the roda will take place at the Claremont Project from 19:30. So no class in the YMCA. Please join us for another great Capoeira Angola celebration.